Early this morning, I took time to walk around the garden in Kuching and did a couple of clearing up job at the side garden especially areas along the south fence. My efforts were rewarded well. The Blood Banana ( Musa zebrina) at the front garden seems to grow into a beautiful small clump now( see inset). I have constantly been watching its growth to ensure that any unruly adventure by the clump to surrounding areas be checked in time. Below can be seen two pictures showing some of the planting details I incorporated to provide initially a green and colourful screen to the black metal fencing material. 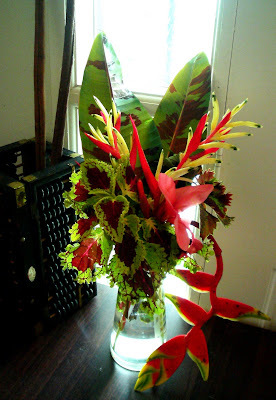 With my secateurs in hand and in rapid succession I took cuttings of young blood banana leaves, the multi-painted coleus leaves, the pendulous red bracts of the 'Firecrackers' ( Heliconia rostrata) , parrot flowers and finally the pink hybrid canna. I placed all of them inside a glass container that's was being held inside a tiny 'tambuk' or the local Bidayuh basket. 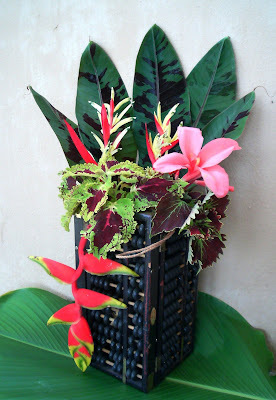 Then I had them inserted inside a special decorative piece - a lamp shade, to hold the plants together for the show. I made two versions for today's arrangement. One is for outside and the other for an inside arrangemment. Am I lost for a title? Well, guess what my mind said just now....Colour Outside, Colour Inside. At the centre of attraction is the Dracaena marginata 'tricolour', being greeted by the parrot flower amidst a chorus of coleus and spider lily. 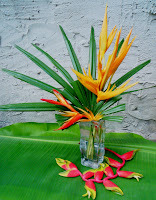 The 'Firecrackers' ( Heliconia rostrata ) and parrot flowers in the background . Today's pictures were taken in Bintulu and I'm posting them from Kuching. The reason being, I was too busy with preparations to go to Kuching that little time was available to prepare for this post in Bintulu. Today ( 1st July) I'm back in Kuching after a month long stay in Bintulu. Today's show comes in a progression. I have used three types of heliconias. 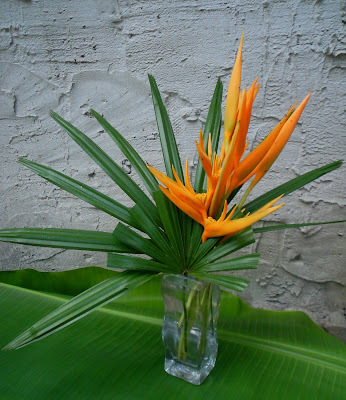 Stage 1 - the yellow bracts of parrot flower is set against the green leaves of the lady's palm. 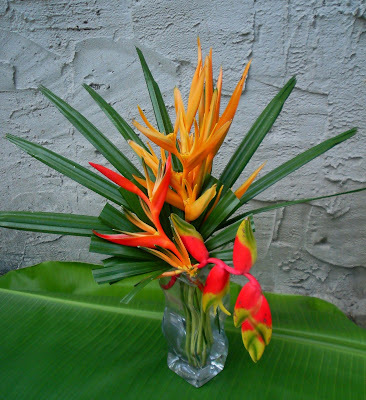 Stage 2 - the green tips and orange colours of the Heliconia latispatha join the crowd. 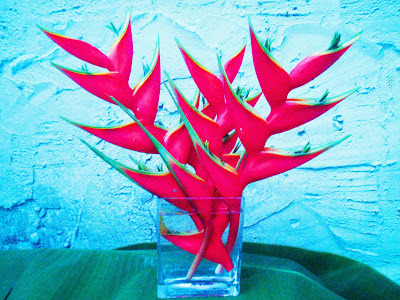 Stage 3 - the red 'Firecrackers' ( Heliconia rostrata) finally tops the show. 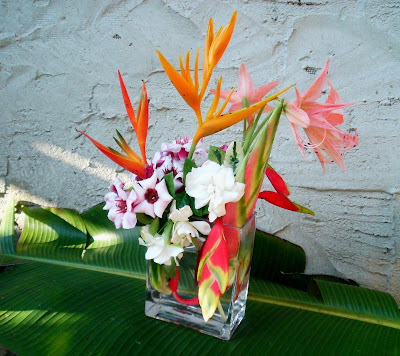 Stage 3 - as the final arrangement.....Arangement # 147.....Hail to the Heliconias. Today the Trumpet Flower ( Bignonia magnifica) were in rich splendour as they reach over the aviary and onto the adjacent trees. 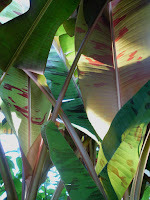 I would like to team them with the colourful leaves of the Blood Banana. 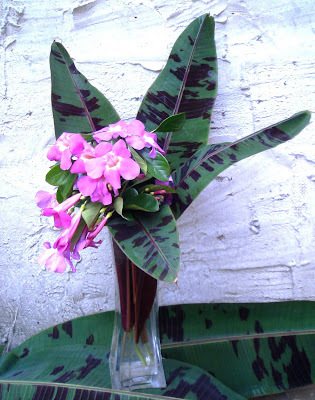 The purple flowers and dark red spots of the wild banana leaves seems to hold on to each other well, I thought. 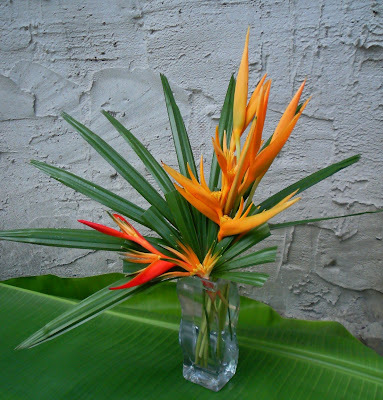 For a simple arrangement I would name it.....Wild and Passionate. 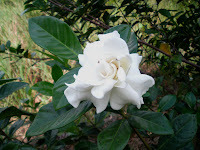 Is the Common Gardenia so common? Try to search for it in towns and there's a 90% chance that you'll hardly see it at all now. I used to see them in abundance in the sixties in village compounds or town houses. These days you'll be thankful if you can stumble upon one. 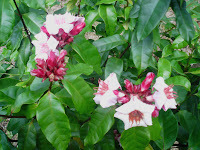 For that reason I have planted scores of this shrub at my farm to keep it in ready stock. 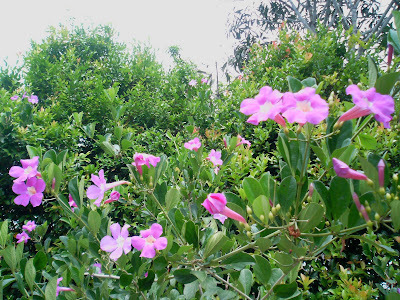 I plant it mainly for its scented pure white flowers and its dark green leaves. I have tried to keep the theme fresh and green today. 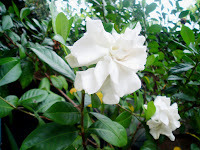 Thus I have matched the pure white flowers of the Common Gardenia ( Gardenia jasminoides) with eye- relaxing green colours of young 'pandan' leaves. Would love to name this composition simply .........Fresh, Young and Pure. I was thinning out some bushes at the vegetation island today when I bumped into a clump of heliconia strictas or red lobster's claws. The pleasant encounter gave me ideas for today's display. I was thinking if only these were real lobster's claws they would not stand a chance to look pretty. Probably will end at the cooking pot. Well, man or woman, cannot live by bread alone. Often we need need aesthetics to recognise God's majesty. So today I rest my soul in the warmth of nature's love as I am feeling pleased that my attempt to grow heliconias here as wild as possible has succeeded to surprise me. Without further ado, I say why not call this composition...S u c c e s s.
Early this morning I was happy to notice the Creamfruit ( Roupellia grata) plant showing off its white flowers ( see inset). This plant was bought from Kuching a couple of months ago. When pruned the plant seems to grow into a beautiful shrub and may exhibit a climbing habit if left unchecked. To match it I gathered as many flowers and colourful bracts as I could. 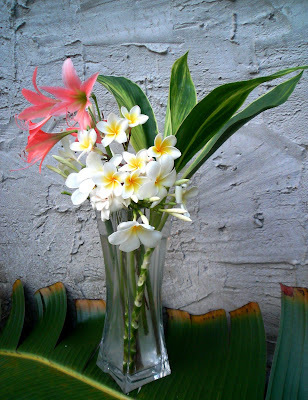 On the list are the heliconias ( 4 varieties), gardenia ( 2 varieties) and the lilium or pink lily hybrid. Today's special I thought. Make the composition as colourful and striking as possible. Today being a Saturday, I would like to name the composition as ...Saturday Matinee. There is so much of fragrance, sweet fragrance in the air today. I see the common gardenia or Cape Jasmine ( Gardenia jasminoides) and the Plumeria rubra var.acutifoloia throwing their scent to the wind. How could I miss this opportunity? 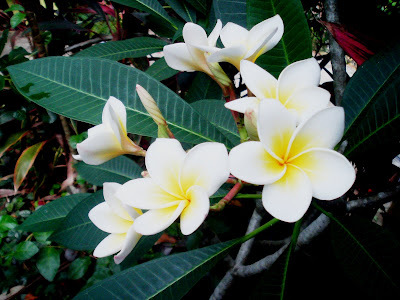 Below is a closer view of the plumeria having smaller sized white petals flushed with yellow in the centre. 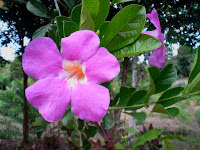 Like the gardenia, plumerias flower continuously. Their bunchy flowers are eye-catching . 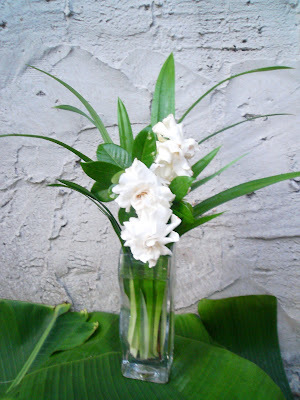 Having gathered the flowers of the gardenia and plumeria, I placed them inside a glass vase. 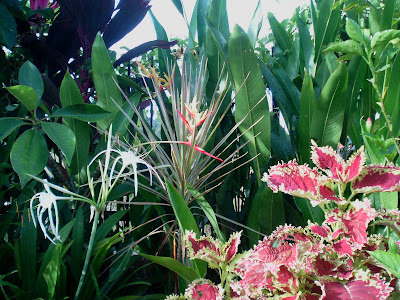 To add greenery I threw in the variegated leaves of cordyline or 'Ti" plant as they are known in Hawaii. The pink colours of Lilium would provide much sparkle to the show. What would you say to a pretty girl in yellow, pink and white ? ......I would say "Wow, You're Pretty." Flowers bring peace into a room. You forget the things that jar. So still they stand in vase or bowl. Their silence speaks unto the soul. chrsysanthemums- bring proud summer to its close. unfold- wine and amber,bronze and gold. cannot doubt that all is well.